Hurry up and serve your friends before they smash the canteen. Deliver their orders and run towards bonuses they leave after your good service. How many points it is possible for you to achieve? 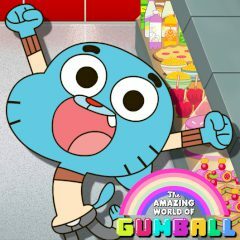 Little Gumball works in the canteen and he often serves his friends. Today he has too many kids who want to have a snack. Serve them before they reach the end of the table and collect bonuses they leave after. How many points you can get serving your friends? Slide the food they order and see for yourself!